That post title, my friends, was just one of the amazing “thought-questions”posed in Mark Batterson’s upcoming tome. I put aside both of the books I had been reading and skipped over the one I was suppose to start next to read a pre-released copy of Batterson’s Wild Goose Chase: Reclaim the Adventure of Pursuing God. Once I picked it up for a quick perusal, I was hooked. The author contrasts animals he got to observe living wild and free while in the Galapagos Islands (which he described as “Edenic” and a place that caused him to feel a great affinity to Adam) in contrast to those he was observing in a zoo a couple of months later. No matter how you slice it, those zoo animals are caged. The whole book plays off the premise that we live our lives in 6 “cages”: responsibility (where God-passions get buried beneath day-to-day living), routine (following our plans, never seeing another way), assumptions (those truths you begin to believe such as I could never…, I can’t…, I’m not…when you are living from your left-brain memory rather than your right-brain imagination). Then there are the cages of guilt (defeat over all our past sin and missteps), failure (doesn’t this one stink?? – trying and failing stops us from ever trying again), and finally the cage of fear (living life on the defense rather than the offense) and goes on to explore both Biblical and modern-day people who were able to break free of those confines. 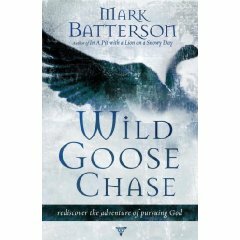 Each chapter is complete and very-good-sermon-like, but Mark Batterson ties them all very well together as he leads us on the chase for the Wild Goose, living a life of adventure by the leading of the Holy Spirit. It’s an easy and quick read, with great humor, some interesting character study and poignant story-telling. It’s kind of like Eldridge’s Journey of Desire or The Sacred Romance, but waaaaaaay shorter and more quickly to the point. He writes in a relaxing, conversational way that was not only engaging for the reading, but seemed to invite me into prayer as I read. That is probably what surprised me the most: how much I was drawn into an awareness of the Presence and His leading as I was reading. Batterson really had a way of posing thoughtful questions that immediately caused me to want to hear from God on the issue or confess and repent or ask for an answer or pray a commitment or something. I prayed my way through most of the book. Laughed and cried, too. NOTE TO SELF: I am part of something bigger and more important than me: the cause of Christ for this generation. I want this book! I am the caged animal.